A poor credit score can prevent you from buying a home or even getting a job. These are just a few aspects of understanding and properly managing money that Southern Illinois University Edwardsville Head Start/Early Head Start parents learned in a 10-week Financial Literacy course, which concluded with a graduation on Wednesday, Dec. 13. Olympic legend and gold medalist Jackie Joyner-Kersee was the featured speaker at the graduation, where Head Start parents were surprised with each receiving $800 for completing the course. The check presented to each graduate was for $300 to start a savings account and $500 for a 529 savings plan for their children. 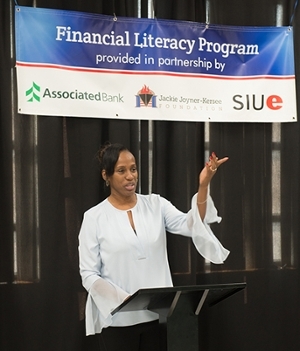 The Financial Literacy course was the second such one offered to Head Start parents and was made possible by the Jackie Joyner-Kersee Foundation, Associated Bank and SIUE Head Start/Early Head Start. The class will continue to be offered to Head Start parents, according to Oliver. The SIUE Head Start/Early Head Start Program is a nationally recognized quality early childhood education program that promotes school readiness for children and financial self-sufficiency for families. Services are available to St. Clair County expectant parents and families of children ages six weeks to five years old. The SIUE Head Start/Early Head Start Program provides services to 1,314 children and families and the Early Head Start Program serves 188 children and families. Both programs include children with specialized needs and English as Second Language Learners (ESL). The SIUE Head Start /Early Head Start Program is the winner of six National Head Start Association Awards. Its mission is to provide quality individualized comprehensive services that empower children, families, and staff from diverse backgrounds in order to achieve success. The Jackie-Joyner Kersee Foundation – Jackie Joyner-Kersee is committed to ensuring that all children have access to high quality after-school programs, safe recreational places within their communities, and caring adults to help them achieve their dreams. Jackie launched the Jackie Joyner-Kersee Foundation in Los Angeles and moved it to East St. Louis in 1995. Inspired by the closing of her neighborhood community center, Jackie grew the Foundation by raising over $12 million to expand programming and built a comprehensive youth and sports. Olympic legend and gold medalist Jackie Joyner-Kersee congratulates SIUE Head Start parent on their strides made toward financial competency. 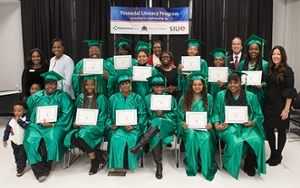 Graduates of the Financial Literacy class received their diplomas and checks on Wednesday, Dec. 13. The course was sponsored by the Jackie Joyner-Kersee Foundation, Associated Bank in East St. Louis and the SIUE Jackie Joyner-Kersee Head Start/Early Head Start Center.